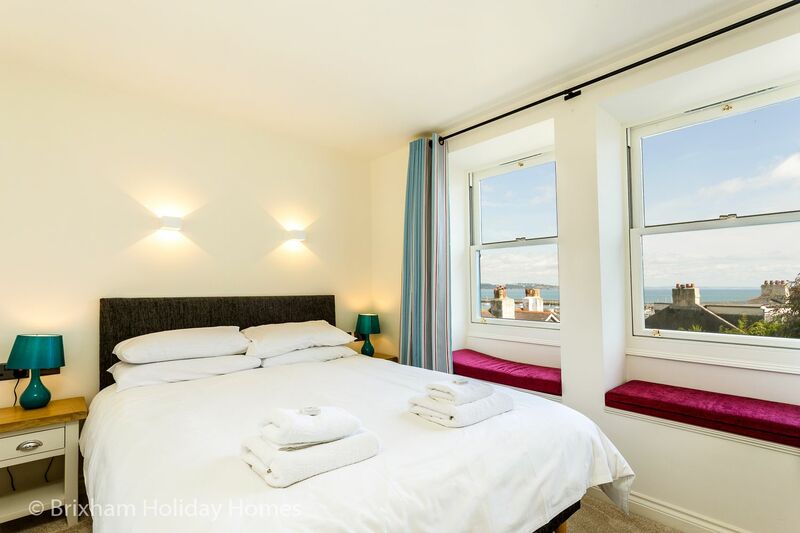 A super luxury self-catering holiday apartment in Brixham with sea views. This brand new (completed August 2017) super luxury apartment has just been built to the highest standard with no expense spared. 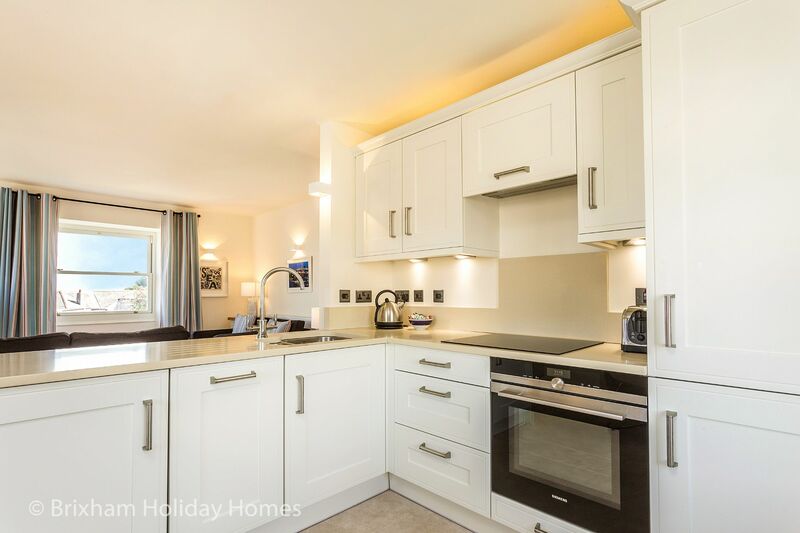 High end furnishings and fittings abound and make this fabulous apartment a luxurious base for your holiday in South Devon. 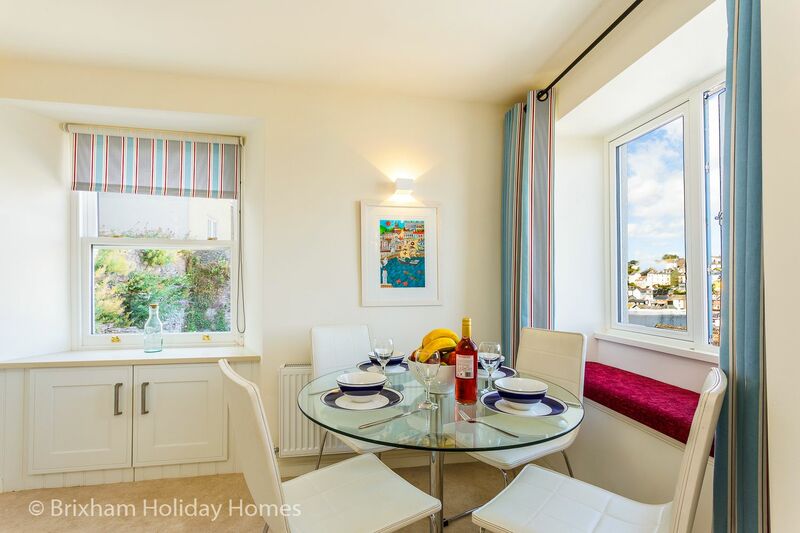 Accommodation briefly comprises an open plan lounge kitchen diner with windows to 3 aspects and wide ranging sea views. 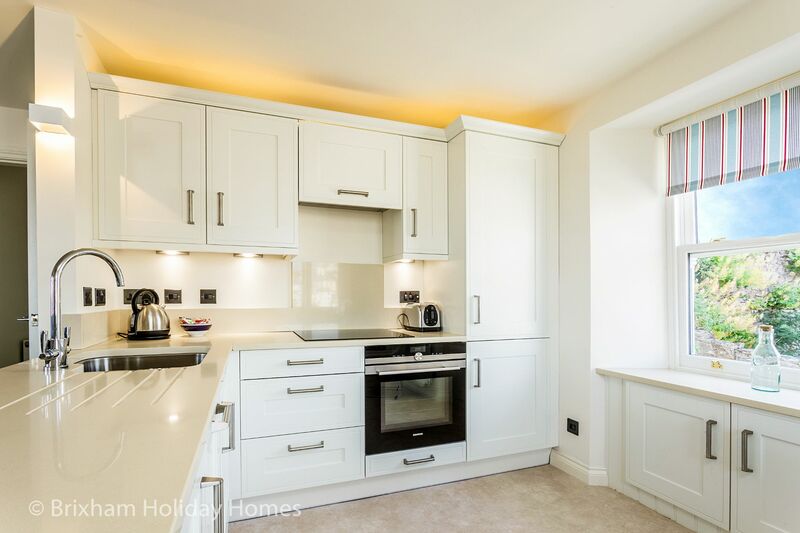 The kitchen has the latest German tech appliances including a combination built in microwave, oven & grill, electric hob, dishwasher and a large fridge freezer. The apartment sleeps 4. 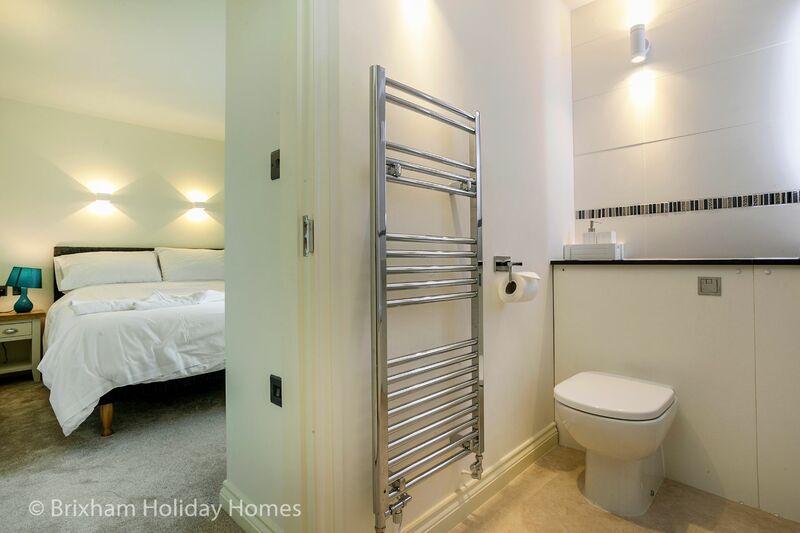 There are 2 king size en-suite bedrooms - one Jack & Jill style with full size bath & shower over. The master bedroom has sea views. 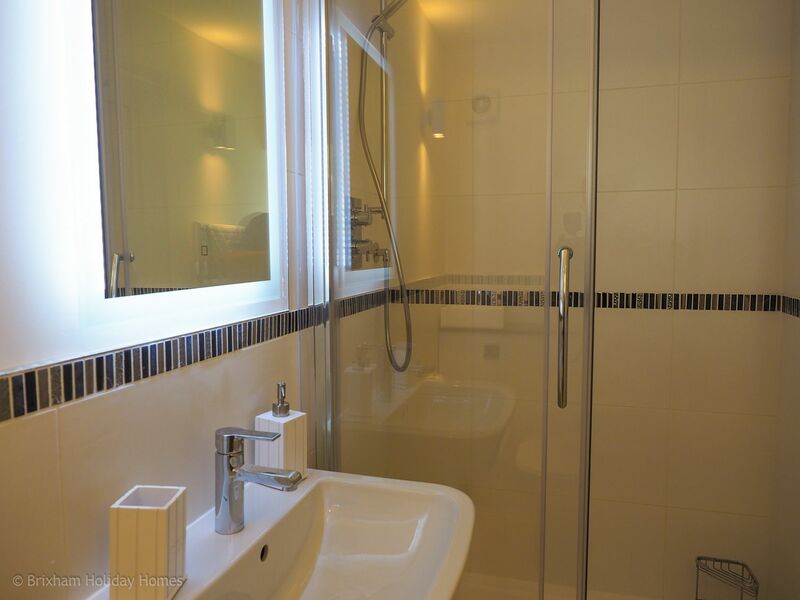 All furniture and fittings are top quality and the decoration and lighting are understated, sleek and modern. 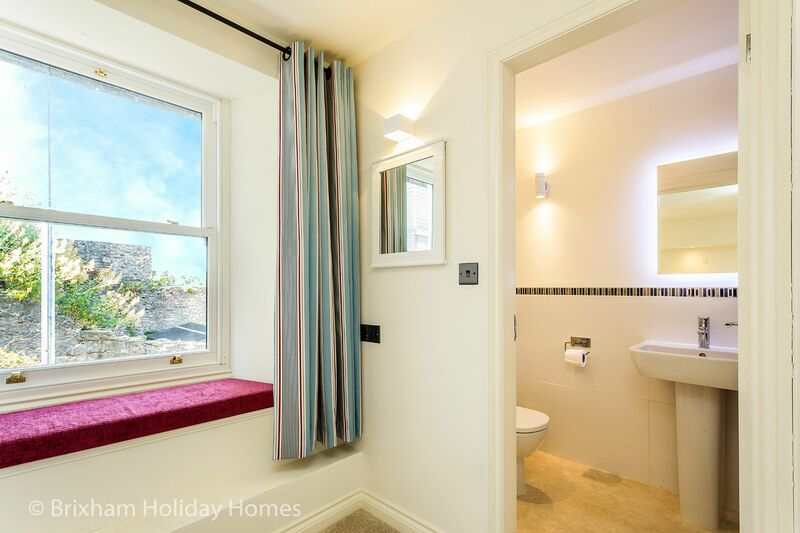 Full central heating makes Bay View a very cosy bolt hole for a luxury Autumn or winter break. 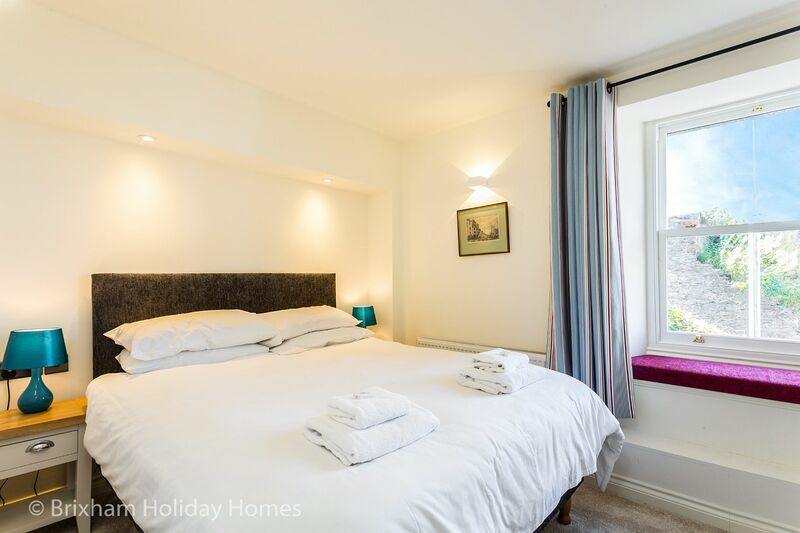 Quality bed linen & towels are included as is free wi-fi. It also comes with a dedicated numbered parking space on the Quayside below - very rare for Brixham. 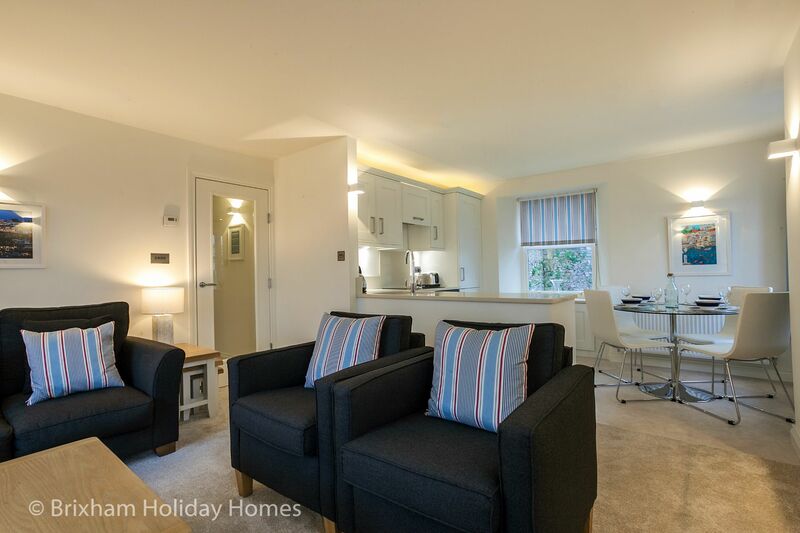 Short breaks of 2 nights or more are available most of the year. No pets allowed - sorry Rex. PLEASE NOTE: There are 50 steep steps (with handrail) to reach the apartment, so it's not suitable for guests with mobility issues. 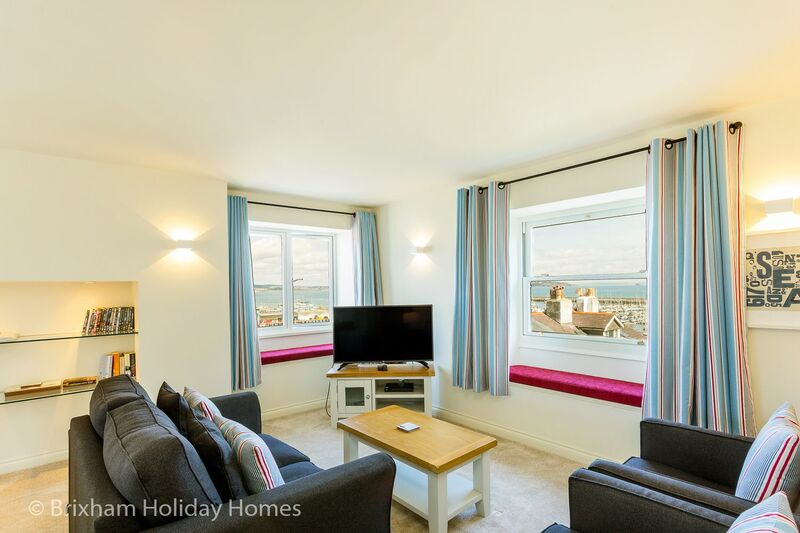 We booked the apartment in Brixham for a weekend getaway and to visit friends, the apartment was just what we wanted, spacious, comfortable, light and modern. 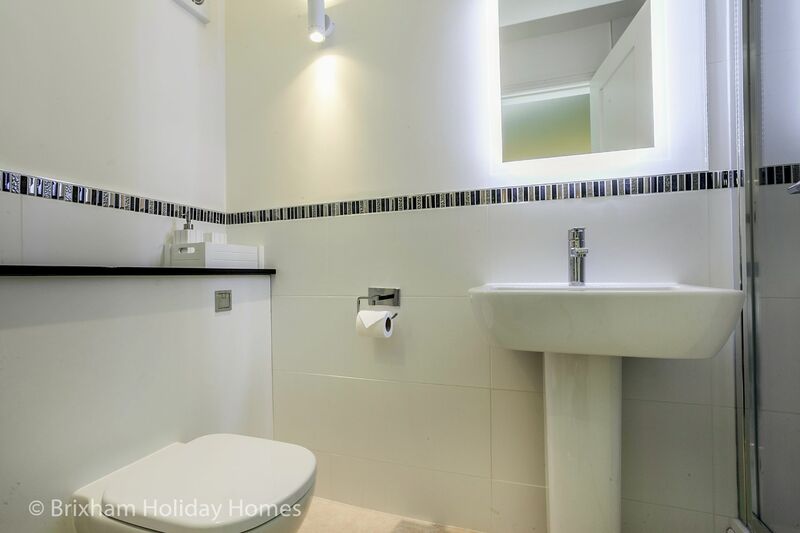 It has verything you fir that perfect home from home holiday. Very close to all amenities and has parking. 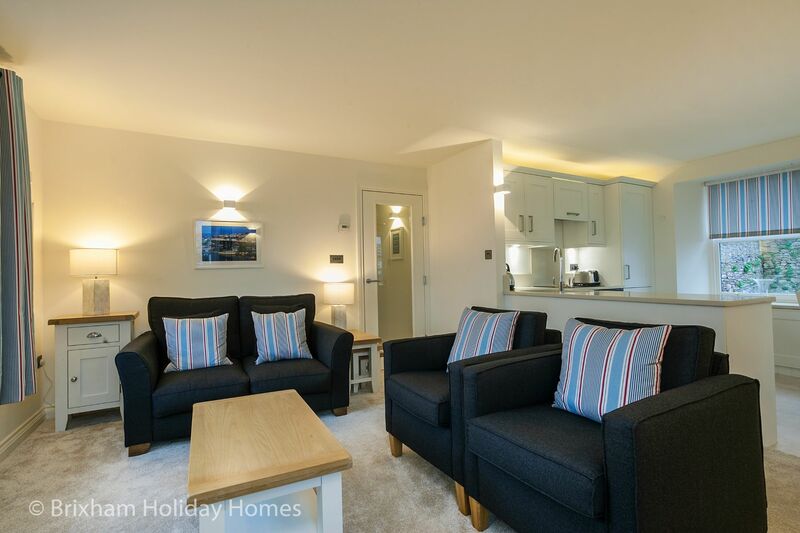 CanÂt recommend this apartment enough you wonÂt be disappointed. We will be back. Arrived at Bay View in February to find it lovely and warm and welcoming. 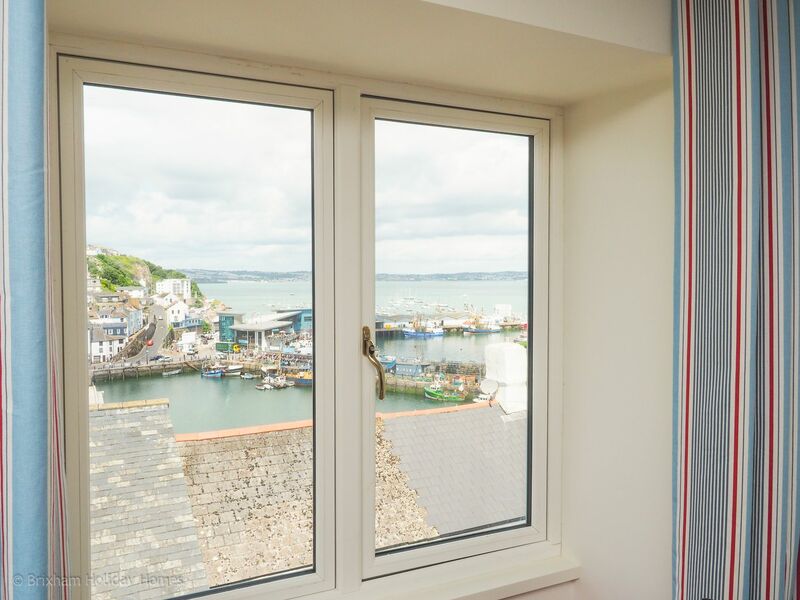 Great views across Brixham Harbour and Torbay which can be enjoyed from the window seats. Using all the steps around Brixham gave us plenty of exercise but may not suit less mobile. Would definitely recommend as a lovely place to stay in this active fishing port. Booking was great and very helpful. Probably the best apartment we've ever found.....and at short notice! Excellent location, really clean, comfortable beds, warm and cosy for our Autumn visit. 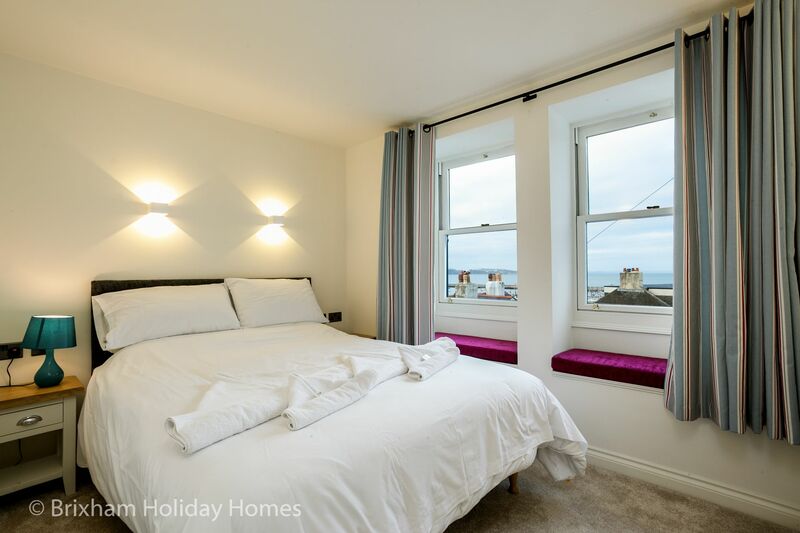 The triple aspect windows with their cushioned seats have super views over the town, inner harbour and outer harbour with fishing port. We enjoyed watching the movement of large and small boats by day and night! 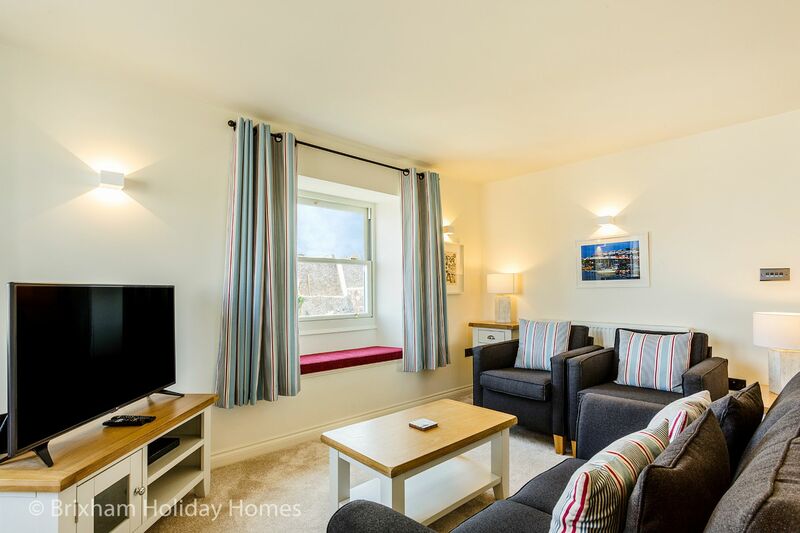 Providing you are able to do steps, this is just a short walk to the harbour, town and a huge choice of fish and chips plus restaurants. The coastal walks in both directions were lovely, with some quiet coves on the way and circular returns all signposted. We parked out car in the designated place on the quayside below the apartment and didn't need to use it until our return home. Look out for the fresh fish offers at the fish market. Just a couple of things to note.....the back street above the apartment is very narrow in places with no place to turn so once you commit to driving it you have no choice. One option is to turn car round at the point suggested for unloading ....... Only thing we felt was missing from this quality apartment was a coffee cafetiere.....but it didn't spoil our visit. Thank you for an excellent short break.....we will be back! 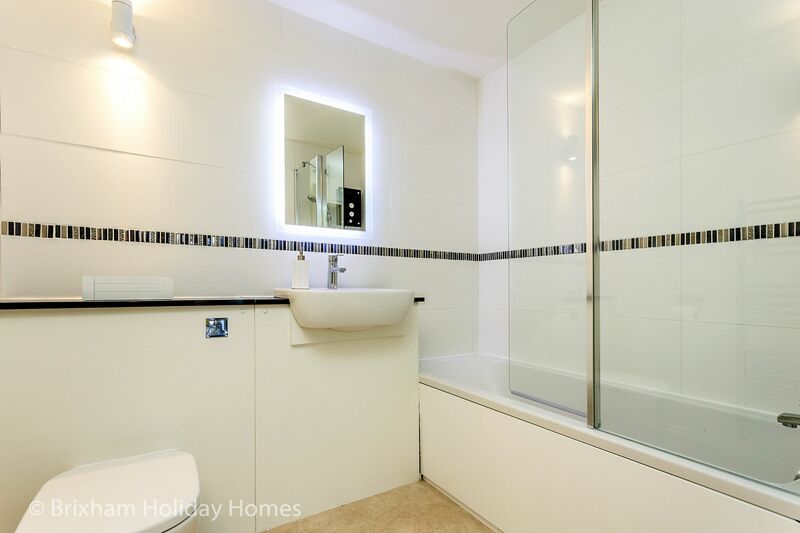 We can highly recommend this property! Spent a lovely couple days there and very impressed with the cleanliness and comfort of the property, it was excellent.It also had the most lovely views.Can think of nothing bad to say! Yes there are steps but we managed without problem and I think wherever you go in Brixham you will find steps...we would definitely hire this apartment again. We had a very enjoyable holiday in this property. Everything was as we expected it having stayed here several times previous. You can't get tired of the views! Everything is within easy walking distance and the stunning views are the benefit you get from having to climb the steps up to the property. 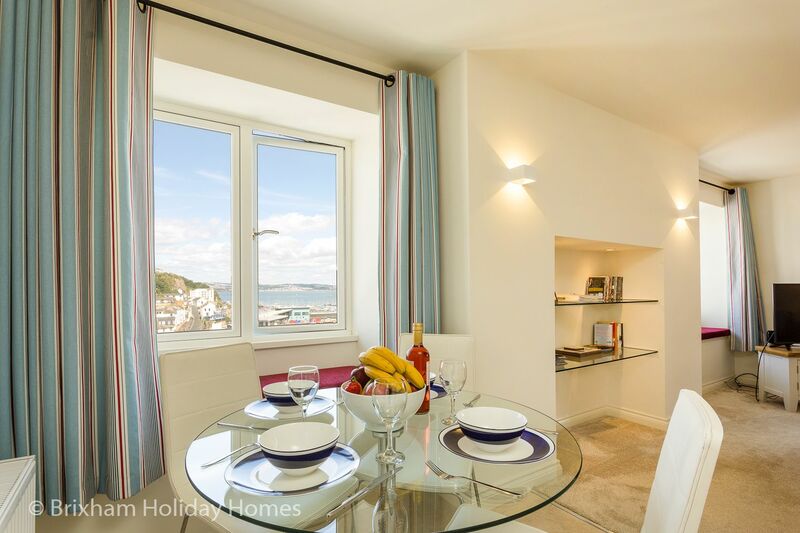 Situated mid way up Bayview steps in Brixham – a central location off King Street, Bay View holiday apartment is close to everything. There are 50 steep steps (with hand rail) to reach apartment, so not suitable for guests with mobility issues.